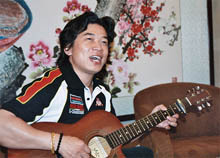 A ballad by Chen Xing featured in a Studio 360 segment (11/16/07) by Gideon D'Arcangelo. "One hundred million Chinese have left rural homes to work in the booming cities of northern China. Their lives are hard, dangerous, and lonely." On the way to work, I meet you. There's so much sadness I share with you. We never ask, Where are you from? But when you need me, I'll be there for you. We fall in love when we work together. There are so many expectations we share together. We bring each other the hope of happiness.